BILOXI, Mass. (CNS) — The harsh realities of racial segregation were spelled out for Bishop Joseph Lawson Howze at an early age. Bishop Howze, 91, a native of Daphne, Alabama, was appointed the first bishop of Biloxi in 1977. He was the first black Catholic bishop in the 20th century to head a diocese, and at the time of his retirement in 2001, he was the top-ranking active black Catholic bishop in the U.S. The bishop recently shared some recollections of growing up in the segregated South and how racial healing was gradually brought about through the 1964 Civil Rights Act. However, Bishop Howze said his family was fortunate in that they were never the targets of serious racial backlash. Nevertheless, Bishop Howze said that, as a young boy, he wondered about different aspects of racial segregation. A cradle Baptist, Bishop Howze attended Most Pure Heart of Mary School in Mobile, Alabama, as a child, and became a Catholic at age 25 under the instruction of Josephite Father Benjamin Horton. He met the priest through the family of a student who was in his homeroom. Bishop Howze taught high school chemistry and biology in Mobile’s public schools and also was assigned a homeroom. The student, Marion Louis Carroll, was a Catholic. The youth’s parents invited him to dinner one evening and he met Father Horton. Bishop Howze was baptized at Most Pure Heart of Mary Church in Mobile Dec. 4, 1948, and made his first Communion the next day at Our Mother of Mercy Mission Church. While waiting to be accepted by a diocese as a seminarian, Bishop Howze spent a year teaching at St. Monica Catholic School in Tulsa, Oklahoma. Bishop Vincent S. Waters of Raleigh, North Carolina, “adopted” him, he said, sent him to the diocesan preparatory seminary in Buffalo, New York. After graduation, Bishop Howze was admitted to Christ the King Seminary at St. Bonaventure in New York, where he was the lone black seminarian but experienced no racial prejudice. He received his doctor of divinity degree in 1959 and was ordained for the Diocese of Raleigh that same year. 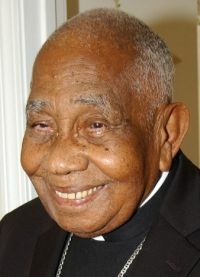 Bishop Howze served in several black parishes throughout North Carolina before being appointed pastor of the Basilica of St. Lawrence, a predominantly white parish in Asheville, in 1968. However, he wasn’t immune to the indignity of racial segregation. In 1972, he was appointed auxiliary bishop of Natchez-Jackson, Mississippi. “I was scared to come here and wondered why I was being sent to this place where there was all this terrible racial segregation,” he said. At the same time as Bishop Howze’s episcopal ordination at the Jackson Civic Center, a kneel-in supporting church desegregation was taking place down the street at the predominantly white First Baptist Church. Bishop Howze’s first assignment sent him to Philadelphia, Mississippi, where three civil rights workers — James Chaney, Andrew Goodman, and Michael Schwerner — were murdered in 1964. Bishop Howze’s appointment was a watershed moment for African-American Catholics. Then-Bishop Joseph Brunini of Natchez-Jackson “was looking for a black bishop to come here,” he recalled. “That’s the reason why I was named here. “Right now, there are more black mayors in Mississippi than any other city in the country and, of course, last year a black guy ran for governor and did well,” said Bishop Howze. Although he supported the cause, Bishop Howze was never directly involved in any of the pivotal events of the Civil Rights movement, primarily because the bishops discouraged clergy and sisters from getting involved, and partly because he had lingering foot problems that prevented him from participating in marches. “The change in Mississippi was phenomenal really, and I think the reason was because the direct relationship between whites and blacks in the South was good,” Bishop Howze said. “I lived in a community in Mobile growing up with both whites and blacks living in the community. But racial segregation was still there. Dickson is editor of the Gulf Pine Catholic, newspaper of the Diocese of Biloxi.